Do you have a fear of the dentist? Does the thought of getting in a dentist’s chair make you afraid? Well, you are not alone. There are lots of people, just like you, who find the idea of a dental appointment terrifying. Over the years, you may have developed a fear that you can no longer control. Much of the time, people have no idea what they are afraid of, which is why they can do little about it. As you already know, excellent dental hygiene is essential. That means that it is unhealthy to avoid oral checkups. There are many reasons you may be afraid of the dentist. Often, people find that their phobia developed when they were children. As they grew up, though, they were unable to shake the ongoing fear of dental surgery. If your phobia is preventing you from taking care of your oral health, things need to change. It is time to take control and take it upon yourself to overcome your fears. Don’t worry, these days many dentists understand this concern and will do what they can to help. Here is how you can overcome your phobia one step at a time. The first thing you ought to do is find a dentist that understands your needs. Here at Glenholme Dental Centre, we specialise in this aspect of dental support. When you find an expert who can help you, everything will be much easier than it is now. Often, people think that their dentist will not understand the way they feel, but that is not the case. Before you book a formal appointment, you can talk to your dentist about any fears you have. They will do everything they can to reassure you and make sure that you are ready for each procedure. The more you know about dental techniques, the easier you should find things. You should also try to make sure that you can understand why you are afraid. If you don’t know what the root of your problem is, you will have no way to deal with it. So, what is it that makes you fear the dentist? You need to pinpoint what the issue is before you can move on. Often people fear that something will go wrong, or the dentist will harm them. With modern dentistry these fears are unreasonable. Over the last decade, there have been many medical advancements in the field of dentistry. That is to say that the scope of the sector is much different to how it once was. The practices are now as pain-free and straightforward as they can be. The truth of the matter is that there is nothing to fear. If you don’t want to head to the dentist alone, why not take a friend or family member along with you? If you have someone by your side, you might find that the experience is less stressful than it would usually be. Sometimes, when you are waiting for your appointment, it helps to have a distraction. Make sure that your friend entertains you with chit-chat while you wait. You won’t believe what a massive difference this will make. When you have social support from the people around you, it will make you feel calm and relaxed. When the dentist is looking at your teeth, you might find the experience overwhelming. If you feel that you need a break, you should signal to him or her that this is the case. Before the appointment starts, agree what signal you want to use. For example, you could raise your arm. That way, you can let your dentist know that you need a moment to collect yourself. Your dentist will then give you some time to do so. Sometimes, the sounds of the dentist’s surgery can be the worst aspect of it. Everything from drilling to tapping can have a bad effect on you. It may help you to block out this noise. Take a music device and some earphones with you. That way, you can listen to relaxing music, rather than the sound of the dental work. You should let the music take you away to another place. While the dentist sees to your teeth, you can chill out and stay calm. Having a fear of dentists is common, and so you should not worry. If you follow this helpful advice, your regular dental checkups will be stress-free. 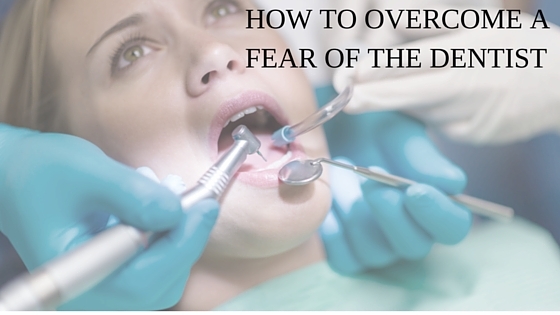 Talk to a dentist that specialises in helping patients face their fears today.